Desperate to start a family, Manhattan-based writer Rachel (Kathryn Hahn) finds herself descending deeper and deeper into the insular world of assisted reproduction and domestic adoption with her loving husband Richard (Paul Giamatti). Within minutes, Private Life captured my heart. I realised that, no matter how this story ended, I would love Tamara Jenkins’s film. And I was right. 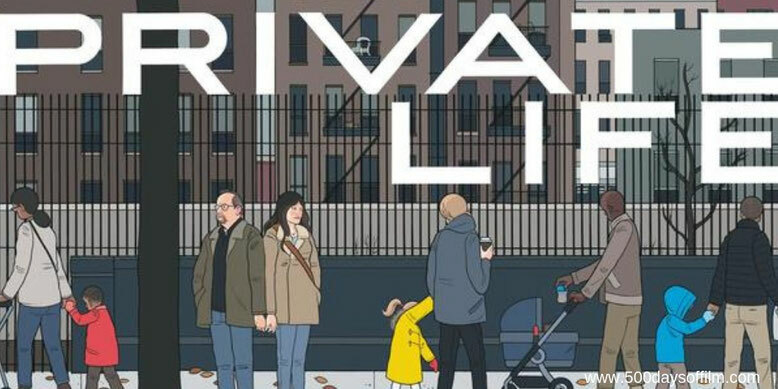 Private Life is smart, engaging, funny and heartbreaking. Each aspect of Rachel and Richard’s journey is strikingly well observed - from how they see the world (full of couples with children) to how their family and friends view the developments in their relationship. The attention to detail is so impressive that I was unsurprised to learn that this story was inspired by Jenkins’s own struggle to have a child. She knows of what she speaks. Private Life explores the impact infertility has on a marriage - the pain and the isolation, the craziness and the comedy. As a result, Jenkins needed two actors who could convey all of the complex emotions in this story. Enter the brilliant combination of Kathryn Hahn and Paul Giamatti. Both are at the top of their game here (Hahn is particularly impressive). From scene one, you are invested in their story - hoping that they get the news they so desperately need. Rachel and Richard’s journey intersects with that of their step-niece, Sadie. Kayli Carter is wonderful in this role. Sadie is a bundle of contradictions. She is both wise and naive, confident and vulnerable, opinionated and self conscious. Thanks to Jenkins's direction and the superb performances from all of the cast, Private Life is an important and honest story. This is an endearing, entertaining and heartbreaking film - a Netflix Original must-watch. Have you seen Private Life? If you have, what did you think of this movie? Let me know in the comments section below. Or let’s chat over on Twitter. You can find me @500DaysOfFilm.